Cabo San Lucas has everything you could ever want in a Mexican city. Once a quiet fishing village, now Cabo San Lucas is full of Mexican flavor! When you buy property in Cabo San Lucas, you’ll experience the carefree indulgence created of the Cabo party lifestyle with the beautiful desert-meets-ocean backdrop. Over the past 25 years, resorts and developments have sprouted, which have made Cabo San Lucas a tourist destination. Sizzling nights happen due to the new restaurants, bars, and nightclubs that can be found downtown. With white beaches, turquoise waters, and spectacular arching stone cliffs at Land’s End — this destination has become the breathtaking backdrop for Baja’s most visited place. You will discover that you can have happy hour at noon (or earlier) at many hotspots along the popular Medano Beach. You can drink, dance, and play in the sand at any of the famous beach party locations. 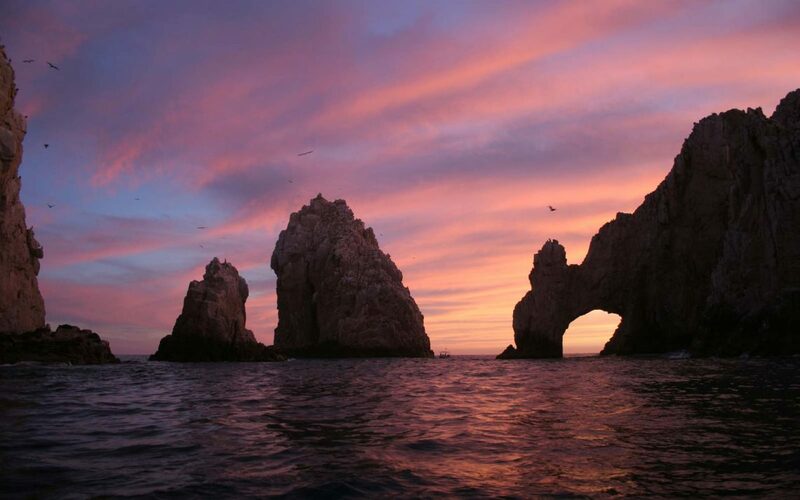 As the sun sets, Cabo San Lucas wakes up, and you can feel the pulsating energy of Cabo. Cabo San Lucas is known for the partying, but there many are other fun things to do here. The activities in this town are endless. You can boat next to spouting whales and dolphins, jet ski, jump on the banana boat, surf, and horseback ride all within city limits. You can even ride a water-propelled jetpack. For outdoor enthusiasts, there are many adventure tour companies offering zip lining, four wheeling, bungee jumping and camel rides along the beach — usually with a drink in hand. There are family activities too! Cabo San Lucas has many activities for families, children, and couples. You can snorkel, dive, fish, and parasail. Gorgeous natural elements and wildlife will surround you. When searching for the perfect place, you’ve probably noticed that real estate in Mexico is less expensive than the U.S. Not only are the properties in Cabo San Lucas less expensive, but the costs associated with owning a home in Cabo are comparatively small as well. Many people buy property in Cabo San Lucas for this reason. It sounds impossible to move to another country. You may feel overwhelmed with having to obtain a visa, get your passport updated, all of the legal hoops you must jump through, etc. I moved to Mexico several years ago from California and own Mexican real estate. It is not as hard as you think and you can absolutely buy property in Cabo San Lucas and live here without citizenship. I would love to connect with you about moving to Mexico and help you buy property in Cabo San Lucas that that fits your lifestyle!